mysterious channels running down a “sand dune” in Russell Crater on Mars. Thanks to a recent high-resolution image taken by the HiRISE instrument, it is now clear that conventional “explanations” of the Russell Crater channels have failed. More alive than ever: the electrical interpretation. “gullies” were created by fluid erosion. The huge HiRISE image can be accessed selectively by zooming in on any region. The HiRISE image provides stunning new support for an electrical interpretation. Channels cut by electric discharge machining will often produce associated non-random cratering and crater chains, now revealed by this latest image. Though the ravines all run downhill, the higher resolution images show that they do not consistently follow topography in the fashion of fluid flow. In electrical terms, that is not surprising. The channels reveal no breeches of levee walls and no outflow at their termination. Within the channels themselves, no evidence can be found of sediment or debris being carried along by fluid. Many of the channels terminate in cleanly cut craters. The “fishbone” formations below the channels find counterparts in lightning scars (as illustrated in a forthcoming TPOD). Finely cut transverse grooves along the channel walls are diagnostic of the filamentary coronas of electric arcs. 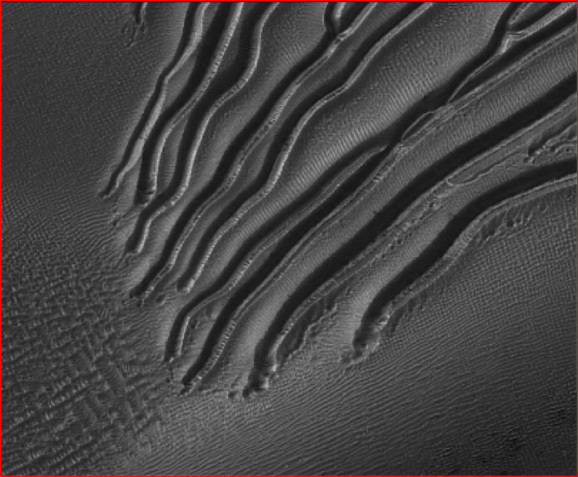 The miniature, patterned “dunes” on the vastly larger “dune” are diagnostic of electrostatic sculpting. Dark spotting and darkened nodules scattered about the region point directly to surface effects of positively charged particle beams in the laboratory. 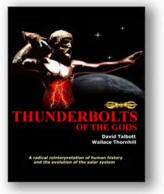 Indeed, it is no exaggeration to say that every defining feature of the Russell Crater anomalies, though challenging standard theory, has an undeniable analog in electric discharge scarring. “Hundreds of enigmatic small channels are seen to carve into the slopes of these dark sand dunes lying within Russell Crater on Mars. These features were previously identified as gullies in images from the Mars Orbiter Camera (MOC) on Mars Global Surveyor, but the higher resolution HiRISE image brings out many new details and mysteries.” And yet, immediately after this acknowledgment an imprisoning theoretical assumption rears its head. “The channels extend from near the top of the dunes to their bases, indicating that some fluid material carved into the sand. The channels commonly begin as smaller tributaries joined together, suggesting several sources of fluid." Browse the massive HiRISE image for yourself. Do you see evidence of avalanching? We can see none--though across every inch of the image we do see the patterns of electrical discharge. Electrical events occurring today on Mars may indeed change forever our outdated ideas about planetary evolution.